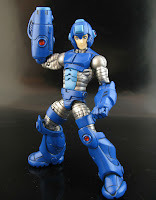 We’ve seen some pretty cool action figures and models over here at Rockman Corner, and today adds one more to the mix. Master action figure customizer Jin Saotome is back at the Mega Man scene again, and this time, he’s rolled out a new, wicked reinterpretation of the Blue Bomber himself. Pieces are coming from every which-way to assemble this 6'' scale masterpiece, as per usual. An Armored Avenger Titanium Man figure makes up the body, a DC Direct Flashpoint Cyborg for the arms and legs, and the head is borrowed from a Cloud Strife figure, fitted with an original helmet mold. 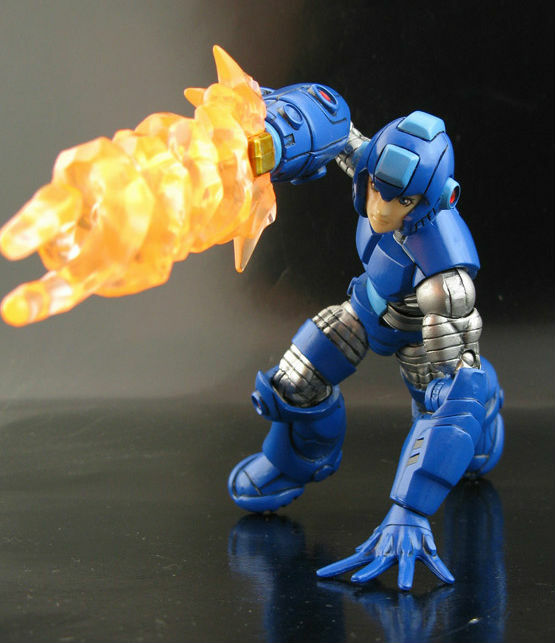 The Mega Buster is the icing on the cake: comes with two interchangeable magnetic attachments -- a fully charged blast and an electric shield -- borrowed from a Doctor Doom figure. Very cool! "Dark are the foretold days of Future Past, where giant robots roam desolate city ruins once home to a sprawling populace. But this future is not yet set and a hero arrives in a beam of light to make sure it never comes to pass! 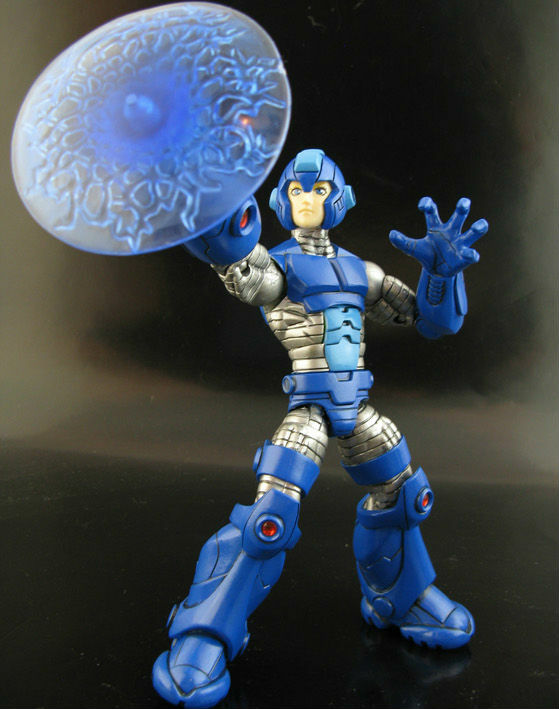 Megaman, the blue bomber himself is here to save the day in Marvel legends 6" scale! This rockin' Rockman has been hand-painted with deep shading, bright highlights, realistic armor effects, metallic sheens, and amazingly intricate detail which will really make him stand out in your Marvel Legends collection." You can find the auction here; and much like previous Mega Man customs, is quickly skyrocketing in price. With six days left to bid, one can only image what the final price tag will be. Best of luck collectors! 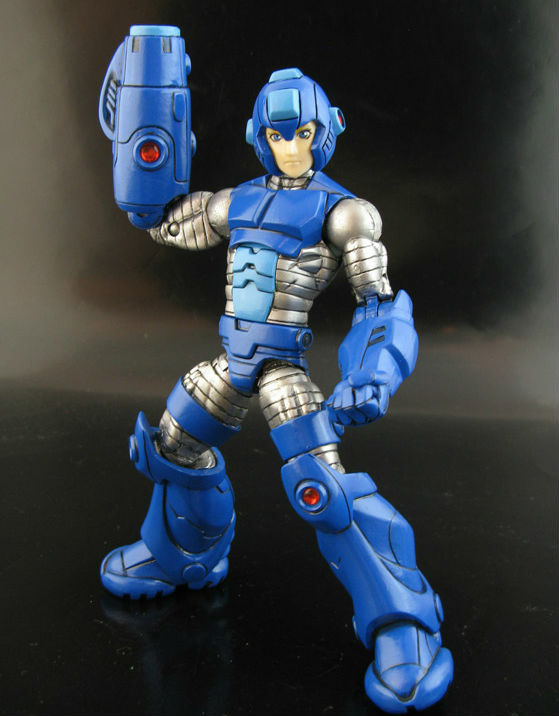 If the 90s Mega Man cartoon had come out in 2011, the hero would have looked like this. Oh look! Iron ma--I mean, Mega Man! Sweet. I wouldn't got hat far in a western interpretation of Mega Man. But it's pretty awesome. I would gladly empty my pockets for it if the silver had been the light blue it's supposed to be. I wanna see this Megaman get a game; looks kickass. Ugh, another derpy jin custom. At least it's not as bad as some of his other stuff. That looks pretty neat, but I do not like the face. It doesn't look menacing enough compared to the rest of the armor. It doesn't match. Really, half the people here like it, half don't. Just because some people don't like a particular interpretation of Megaman doesn't mean the whole fandom is turning into a bitchfest. Really, it's all up to someone's personal opinion. Well... I some what like it. I like how it's more robotic. Though I say the silver/grey areas should of been in light blue metallic. But at least it better than anything than Jazware Inc. and also that it has better joints than the stupid joints on the D-Arts. What makes the D-Arts joints so bad? They work fine, and they aren't exactly fragile for a collector's figure. The only time they might break is if someone hamhands them. @McWchalen: Except this is the first time I've said anything of the sort? I'm not sure why you think I'm "waiting for any negative response" to say something. It's more that I've just been noticing a lot of negativity lately, in general, and not just on this post. Ya, some people like the figure, but I'm just a little sick of seeing so many people heartlessly put down the fan-made works of fellow Mega Man fans. I mean, a lot of hard work and devotion goes into making something like this. There's nothing wrong with constructive criticism, of course, but comments like the ones made by anon2, anon4, and anon8, for example, aren't constructive at all. You want to talk about "not nice"? Insulting the hard working fan-made efforts of another Mega Man fan is what's really not nice, and I'm just sick of seeing it. Granted, people are free to give whatever opinion they want, but that being said, I'm free to express my disgust with the way said opinions are delivered. Sometimes people like to showcase their opinions. Saying something about can't stop it, no matter what you do. You sure seem to be quick to keep reminding me that everything I say is "stupid", to say nothing of the fact that you're ignoring that I said I don't have a problem with difference of opinions or constructive criticism. I merely think people should be a little more tactful when expressing their opinions toward somebody else's work. But I guess asking for common courtesy is a "stupid" thing to ask for. Anyway, while you may be quick to call everything I say "stupid", I never once called anyone "spoiled brats" or anything of the sort. I never called anyone "disgusting", either; I said that I was disgusted with the way certain things were stated. Perhaps my first comment can come off as a bit generalizing, and for that I apologize. But I still stand by my belief that even on the internet (the land of anonymity), one should be at least a little bit tactful. I'm done talking about this. I'd rather not have my words continue to get mangled up and misrepresented any further. Besides that, there's enough going on with both the series and the fandom, that it really doesn't do us any good to be fighting amongst ourselves. But really there is nothing wrong with different opinions in fanbase and i really haven't seen 4chan language here either.Why were you offended again? @McWhalen: I'm guessing he was offended at people dismissing/insulting this guy's work out of hand (probably because it doesn't look like game-Mega). 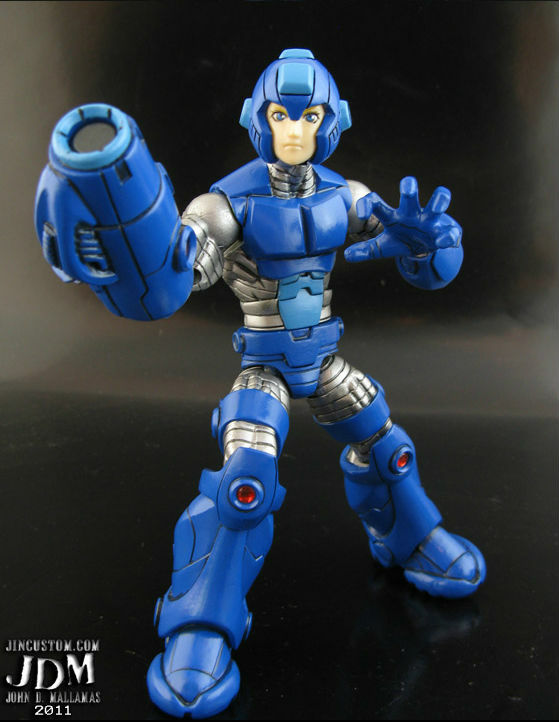 it kinda looks like a beefed up version of the megaman in the cartoon from 1995.